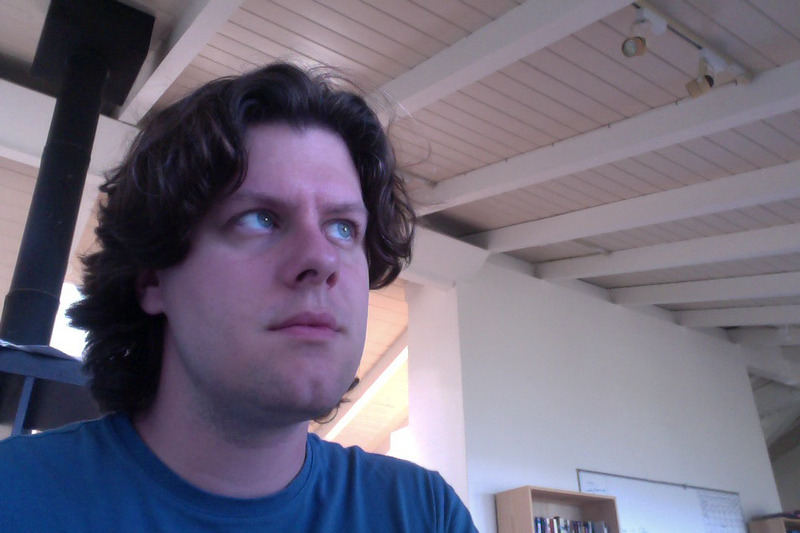 I'm Adam M. Smith, computer scientist, design researcher, and software artist. Some people have read my dissertation, many have listened to my music, and many many many have played with my software toys. Artificial intelligence for design is my description for the work I started with Michael Mateas at UC Santa Cruz and continued with Zoran Popović at the University of Washington. My dissertation, Mechanizing Exploratory Game Design, built a design automation practice in the interdisciplinary space between game design, design studies, computational creativity, and symbolic AI. I often employ answer set programming (and related combinatorial search/optimization tools such as model checkers and constraint solvers) in the service of exploratorily posing and automatically solving high-complexity analysis and synthesis problems arising in creative design domains. As a postdoctoral researcher, I applied these ideas to deep design automation for educational games played by millions of students around the world. Recently, I've been researching ways of making this search-intensive automation available to everyday programmers who are invested in domains outside of artificial intelligence. The result, blending recent ideas from machine learning, formal verification, processor design, and cryptography, is a surprising new way of programming. This idea is being developed by my new company: Quasilinear Research. Actually, the new company is on hold for now. I've taken a job as a Research Engineer at Microsoft. (A researcher at Microsoft but outside of MSR? It's an experiment!) I'm associated with the Research in Software Engineering (RiSE) group in MSR while being embedded in an Enterprise engineering organization. I'm on Sumit Gulwani's team developing developing industrial strength and widely accessible program synthesis by example systems. Aaaaactually, I've accepted a job as tenure-track faculty within the department of Computational Media at UC Santa Cruz. In the meantime, however, I've been pleasantly/exhaustingly interrupted by the engrossing world of fatherhood. I'll think about updating this webpage when I get back to sleeping more than ninety minutes at a time. In addition to the serious stuff above, I like to explore generative visual art and music, recreational programming all the way down to the hardware/RF level, and infinitesimal-thrust spacecraft design and orbital dynamics. I also bake bread. "Design Space Modeling" approach to procedural content generation: write down what you think you want, not how to generate it. "Quantification over Play" formulation of interactive design: explicitly sculpt the space of interaction your design affords. "Answer Set Programming for Design Automation" approaches and tooling (e.g. test automation and domain-specific metaprogramming) for industrial-strength application for ASP to applied design projects. "Rational Curiosity" conception of game design: don't design to optimize player fun; design to learn how to design (cf. reflective practice). "Transient Rendering Equation" formulation of light transport for time-resolved graphics and vision applications: light moves at a finite speed; simulate it accordingly. "Learning Rotations" problem in online machine learning were the true model lives on a differentiable manifold: search on the circle, not on the line. Ultimate goal: Dramatically increase the creative resources available to our civilization by using machines to amplify the creativity of those facing complex design problems (particularly those involving the self-improvement of civilization, e.g. education and research). I am deeply passionate about teaching technical topics, particularly where I can steer them to overlap with creative and aesthetic endeavors. I regularly volunteer to give guest lectures, design new projects, and consult on the curriculum for new classes. I provide lifetime support to my students on selected topics and delight in hearing the challenges they encounter in industry and grad school elsewhere. Where possible, I work to legitimize self-teaching outside of established institutions. as Lecturer: AI in Games (UCSC CMPM146 Spring 2015); Android Tablet Programming. as Teaching Assistant: introduction to computer graphics; scientific visualization and computer animation; game engine architecture; fundamentals of game design; game design studio; advanced analysis of algorithms; computer literacy. as Guest Lecturer: game programming with python; the spectrum of game engine architectures; designing a simple game framework; image compositing; non-photorealistic rendering; programmer-oriented tools for creativity in graphics; livecoding for music, sculpture, and poetry; overlapping notions of time in programming languages and software engineering. (Ideally not-so) Controversial curriculum I advocate: Bayesian inferential calculus; geometric algebra; procedural literacy; massively multi-language introductions to programming. Adam M. Smith, Michael Mateas, "Answer Set Programming for Procedural Content Generation: A Design Space Approach," IEEE Transactions on Computational Intelligence and AI in Games, 2011. Xiaoxuan Zhang, Zeping Zhan, Misha Holtz, Adam M. Smith, "Crawling, Indexing, and Retrieving Moments in Videogames" in Proceedings of Conference on the Foundations of Digital Games (FDG), 2018. Oleksandra Keehl, Adam M. Smith, "Monster Carlo: an MCTS-based Framework for Machine Playtesting Unity Games," in Proceedings of the IEEE Conference on Computational Intelligence in Games (CIG'18), 2018. Oleksander Polozov, Eleanor O'Rourke, Adam M. Smith, Luke Zettlemoyer, Sumit Gulwani, Zoran Popović, "Personalized Mathematical Word Problem Generation," In Proceedings International Joint Conference on Artificial Intelligence (IJCAI-15), 2015. Mike Treanor, Alex Zook, Mirjam P. Eladhari, Julian Togelius, Gillian Smith, Michael Cook, Tommy Thompson, Brian Magerko, John Levine, Adam M. Smith, "AI-Based Game Design Patterns," In Proceedings of the 10th International Conference on the Foundations of Digital Games (FDG 2015), 2015. Eric Butler, Erik Andersen, Adam M. Smith, Sumit Gulwani, Zoran Popović, "Automatic Game Progression Design through Analysis of Solution Features," In Proceedings of the SIGCHI Conference on Human Factors in Computing (CHI'2015), 2015. Eric Butler, Adam M. Smith, Zoran Popović, "A Mixed-Initiative Tool for Designing Level Progressions in Games," In Proceedings of the ACM Symposium on User Interface Software and Technology (UIST 2013), 2013. Adam M. Smith, Eric Butler, Zoran Popović, "Quantifying over Play: Constraining Undesirable Solutions in Puzzle Design," In Proceedings of the 8th International Conference on the Foundations of Digital Games (FDG 2013), 2013. Adam M. Smith, Erik Andersen, Michael Mateas, Zoran Popović, "A Case Study of Expressively Constrainable Level Design Automation Tools for a Puzzle Game," In Proceedings of the 7th International Conference on the Foundations of Digital Games (FDG 2012), 2012. Adam M. Smith "Strange Loops in cfml, A Livecoder's Riddle" In Proceedings of the International Conference on Computer Music (ICMC 2012), 2012. Adam M. Smith, Michael Mateas, "Knowledge-Level Creativity in Game Design," In Proceedings of the Second International Conference on Computational Creativity (ICCC 11), 2011. Adam M. Smith, Michael Mateas, "Towards Knowledge-Oriented Creativity Support in Game Design," In Proceedings of the Second International Conference on Computational Creativity (ICCC 11), 2011. Adam M. Smith, Mark J. Nelson, Michael Mateas, "Ludocore: A Logical Game Engine For Modeling Videogames," In Proceedings of the IEEE Conference on Computational Intelligence and Games, 2010. Adam M. Smith, Michael Mateas, "Variations Forever: Flexibly Generating Rulesets from a Sculptable Design Space of Mini-Games," In Proceedings of the IEEE Conference on Computational Intelligence and Games, 2010. Kathleen Tuite, Noah Snavely, Dun-Yu Hsiao, Adam M. Smith, Zoran Popović, "Reconstructing the World in 3D: Bringing Games with a Purpose Outdoors, In Proceedings of the 5th International Conference on the Foundations of Digital Games (FDG 2010), 2010. Adam M. Smith, Mark J. Nelson, Michael Mateas, "Computational Support for Play Testing Game Sketches," In Proceedings of the 5th Artificial Intelligence for Interactive Digital Entertainment Conference (AIIDE 2009), 2009. Zachary Pousman, Mario Romero, Adam M. Smith, Michael Mateas, "Living with Tableau Machine: A Longitudinal Investigation of a Curious Domestic Intelligence," In Proceedings of the 10th International Conference on Ubiquitous Computing (UbiComp 08), 2008. Adam M. Smith, Manfred K. Warmuth, "Learning Rotations," In Proceedings of the 12th Annual Conference on Learning Theory (COLT 08), 2008. Zeping Zhan, Adam M. Smith, "Retrieving Game States with Moment Vectors," In Proceedings of the Workshop on Knowledge Extraction from Games (KEG-18), 2018. Dan Ashlock, Cameron Browne, Simon Colton, Amy K. Hoover, Jialin Liu, Simon M. Lucas, Mark J. Nelson, Diego Perez Liebana, Sebastian Risi, Jacob Schrum, Adam M. Smith, Julian Togelius, and Vanessa Volz, "Game Search Space Design and Representation," In Report from Dagstuhl Seminar 17471, Artificial and Computational Intelligence in Games: AI-Driven Game Design, 2017. Peter I. Cowling, Sander C.J. Bakkes, Pier Luca Lanzi, Adam M. Smith, Pieter Spronck, and Shoshannah Tekofsky, "Some Industry Interests in AI-driven Game Design," In Report from Dagstuhl Seminar 17471, Artificial and Computational Intelligence in Games: AI-Driven Game Design, 2017. Gillian Smith, Mirjam P. Eladhari, Matthew J. Guzdial, Emily Short, Adam M. Smith, Anne Sullivan, Tommy Thompson, and R. Michael Young, "AI as Reflective Practice," In Report from Dagstuhl Seminar 17471, Artificial and Computational Intelligence in Games: AI-Driven Game Design, 2017. Adam M. Smith, "Answer Set Programming in Proofdoku,", In Proceedings of the Fourth Workshop on Experimental AI in Games (EXAG 4), 2017. Isaac Karth, Adam M. Smith, "WaveFunctionCollapse is Constraint Solving in the Wild," In Proceedings of the Eighth Workshop on Procedural Content Generation (PCG2017), 2017. Adam M. Smith, "ASP versus EAs: What Are We Really Searching for in PCG?," In Report from Dagstuhl Seminar 15051, Artificial and Computational Intelligence in Games: Integration, 2015. Adam M. Smith, "MCTS for PCG," In Report from Dagstuhl Seminar 15051, Artificial and Computational Intelligence in Games: Integration, 2015. Adam M. Smith, "Open Problem: Reusable Gameplay Trace Samplers," In Proceedings of the Second Workshop on Artificial Intelligence in the Game Design Process (IDPv2), 2013. Kathleen Tuite, Adam M. Smith, "Emergent Remix Culture in an Anonymous Collaborative Art System," In Proceedings of the First International Workshop on Human Computation in Digital Entertainment (HCIDE12), 2012. Kate Compton, Adam M. Smith, Jim Whitehead, "Anza Island: Novel Gameplay Using ASP," In Proceedings of the Third International Workshop of Procedural Content Generation in Games (PCGames 2012), 2012. Adam M. Smith, Michael Mateas "Computational Caricatures: Probing the Game Design Process with AI," In Proceedings of the First International Workshop on Artificial Intelligence in the Game Design Process (IDP11), 2011. Adam M. Smith, "Two Methods for Voxel Detail Enhancement," In Proceedings of the Second International Workshop of Procedural Content Generation in Games (PCGames 2011), 2011. Sherol Chen, Adam M. Smith, Michael Mateas, Noah Wardrip-Fruin, Arnav Jhala, "RoleModel: Towards a Formal Model of Dramatic Roles for Story Generation," In Proceedings of the Intelligent Narrative Technologies III Workshop (INT3), 2010. Adam M. Smith, Mario Romero, Zachary Pousman, Michael Mateas, "Tableau Machine: A Creative Alien Presence," in Proceedings of the 2008 AAAI Spring Symposium on Creative Intelligent Systems, 2008. Adam M. Smith, Chris Lewis, Kenneth Hullet, Gillian Smith, Anne Sullivan, "An Inclusive Taxonomy of Player Modeling," Technical Report UCSC-SOE-11-13, 2011. Adam M. Smith, Manfred K. Warmuth, "Learning Rotations Online," Technical Report UCSC-SOE-10-08, 2010. Adam M. Smith, James Skorupski, James Davis "Transient Rendering," Technical Report UCSC-SOE-08-26, 2008. Mike Treanor, Nicholas Warren, Mason Reed, Adam M. Smith, Pablo Ortiz, Laurel Carney, Loren Sherman, Elizabeth Carré, Nadya Vivatvisha, D. Fox Harrel, Paola Mardo, Andrew Gordon, Joris Dormans, Barrie Robison, Spencer Gomez, Samantha Heck, Landon Wright, Terence Soule, "Playable Experiences at AIIDE 2017," In Proceedings of the Thirteenth AAAI Conference on Artificial Intelligence in Interactive Digital Entertainment (AIIDE-17), 2017. Adam M. Smith, "Towards Probabilistic Programming at the Machine Code Level," First RISC-V Workshop, 2015. Adam M. Smith, Chris Lewis, Kenneth Hullett, Gillian Smith, Anne Sullivan, "An Inclusive View of Player Modeling," In Proceedings of the 6th International Conference on the Foundations of Digital Games (FDG 2011), 2011. Adam M. Smith, Michael Mateas, "Variations Forever: A Game of Exploring Game Design Spaces," Demonstration at the Fourth International Conference on the Foundations of Digital Games (FDG 2009), 2009. Adam M. Smith, Mark J. Nelson, Michael Mateas, "Prototyping Games with BIPED," in Proceedings of the Fifth Artificial Intelligence for Interactive Digital Games Conference (AIIDE'09), 2009. Adam M. Smith, James Skorupski, James Davis, "Understanding Video at 30 Billion Frames Per Second with Transient Rendering," Poster at Bay Area Vision Meetup (BAVM 2009), 2009. Professional: AAAI; ACM and ACM SIGCSE; IEEE and IEEE CIS; IGDA and Game Education SIG.